First, the bad news for Buffer. The startup of European expats in San Francisco is being kicked out of the country due to our stupid, self-destructive immigration laws. They’re temporarily relocating to Hong Kong while they try to figure things out. And the good news? The company, which offers a tool for letting you schedule social content sharing over the course of the day and the week, is announcing that it has raised $400,000 in angel funding. Not bad for some guys who showed up in Silicon Valley, as they’ll tell you, with no money or connections. But let’s back up and look at what Buffer does. Let’s say you’re like a lot of other people, and you read most of your news for 15 minutes in the morning, and another 15 at lunch. And let’s say you find ten stories on a given morning that you really think your friends on Facebook or your followers on Twitter are going to want to know about. Instead of blasting everything out to everyone in real-time, Buffer lets you set each article to publish at a different point throughout the day. This will help the content you share get maximum exposure without feeling as spammy to the people reading it. Who needs to be this thoughtful about sharing? Anyone trying to build up their thought leadership by being a quality filter for information. It’s an especially good fit for marketers. The results so far: 80,000 users a day, including 1,400 paying users who provide a revenue run-rate of around $200,000. Those stats are all up around 10% from a month ago when I talked to the company about its integration with If This Then That. The Buffer interface includes a variety of options for setting the service to share to, the time you want the content shared, which stories are pending, and more. The company also recently added a Chrome extension where you can Buffer any articles you’re reading, or any tweet you see on Twitter.com, while browsing. 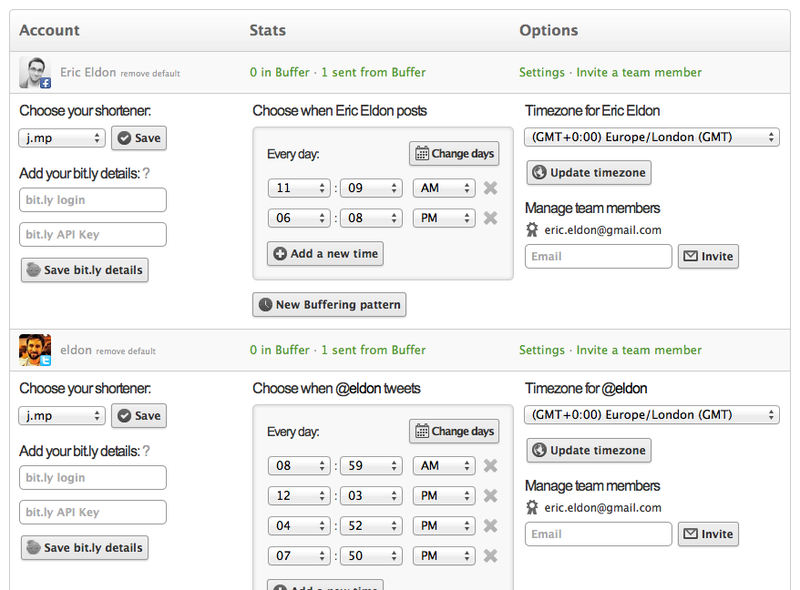 It also has a widget for web sites, that a number of social media bloggers have integrated. 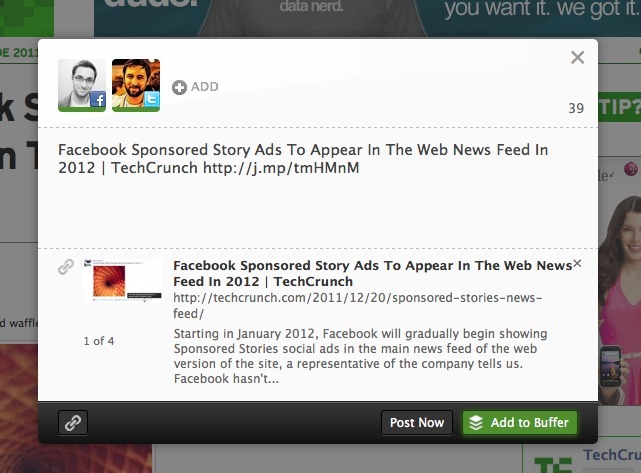 Like other share buttons, it lets you share — back to Buffer, automatically scheduled for sharing. So why is the company raising money? Cofounder Leonhard Widrich tells me that it’s to hire faster (the common story these days for growing startups) as well as to bring in the network of some 19 angel investors who are providing the funding. Overall, the product fits a need that a growing number of people have. (Although I admittedly don’t because I’m either spamming you all with my content in real-time, or I’m scheduling it to post WordPress.). The company has put together a little more about each of their new investors, and how they met. Here’s an excerpt about one of them. Here is another crazy story for you. Joel wrote a most complete guide on how he went from idea to paying customer within 7 weeks. Guy found and liked the story. He posted it to Google Plus. I got in touch and thanked him for posting it. At the same time, Daniel Brusilovsky had connected us with the founders of Evernote. Evernote invited us to attend their conference in San Francisco to chat with us about potentially collaborating. At this conference, Guy Kawasaki was the keynote speaker. We caught him after it and showed him Buffer. He liked it a lot and we started chatting about future ideas and what his thoughts are. After this, we kept in touch and he linked us up with more people, gave us more ideas and is now a full advisor to Buffer. Crazy eh?